Fun fact: only 20% of potential job candidates frequent traditional job boards like Craigslist and Indeed. Of the remaining 80%, most already have a job, but a large percentage of these passive job candidates would gladly switch jobs if the right offer came around. This means that if you’re focusing all of your sourcing efforts on old-school job sites, you’re cutting yourself off from a whole wealth of candidates who might be perfect fits for your team. 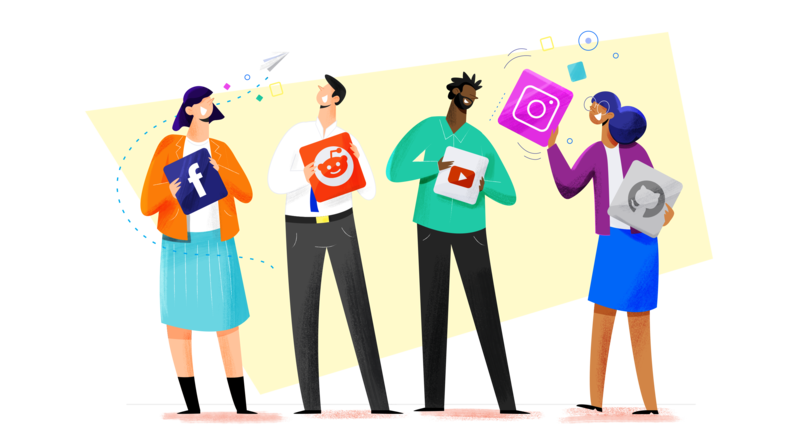 Compared to traditional job sites, social media platforms can attract huge numbers of users—including both passive and active job seekers. This is precisely the allure of using social media for recruitment purposes; your messaging reaches more people and a wider demographic becomes familiar with your employer brand. That said, not all platforms are created equal. Different demographics flock to different sites during their downtime, and it’s important to make sure that you’re putting the bulk of your resources into places where your ideal hires (i.e. your candidate personas) are likely to be spending their time. If you’re hiring technical positions at a growing startup, for instance, you might be able to target your personas more effectively on Reddit or Stack Overflow than on, say, Pinterest. By contrast, if your goal is to attract recent college graduates for an internship program, networks like Snapchat that skew towards a younger demographic might be better places to invest your time and efforts. So far, we’ve discussed social media as an alternative to traditional job boards, but it's important to remember that in most ways social media is a completely different animal. The reason that passive job candidates avoid places like Indeed is that there’s a very limited amount of learning or interaction that can take place there. Social media, by contrast gives users a place to engage with stories from people and brands alike while consuming high quality content. Thus, while you can and should think of platforms like Facebook as places to source candidates, you should only do so within a broader employer branding strategy. Instead of simply being a place to post job listings, your corporate or career page on a given social channel can be a place to highlight what makes your company unique and to give potential applicants a sense of what it would be like to work with you. How, exactly, do you do this? By generating and sharing content that highlights your employer brand and defines your EVP (employee value proposition). This will help to build brand awareness in a way that supports your more targeted sourcing efforts. Speaking of more targeted sourcing efforts: once you’ve established a content strategy on your platform or platforms of choice, it’s time to incorporate paid job ads into your overall social media efforts. Why is this necessary? Because platforms like Facebook are designed to make it difficult to reach your target audience organically. This means that even if much of your content is successful, it’s still fairly unlikely that a given job posting will show up in very many newsfeeds. This can be a double edged sword. On the one hand, it means that sourcing candidates without at least a small ad budget can be difficult. On the other, even without spending a huge sum of money on your campaigns, social media sites like Facebook give businesses such granular ad targeting options that it’s often possible to reach your candidate personas at a relatively low cost per impression. Facebook ads, for instance, will let you retarget ads to users who have already interacted with your page, and will also create duplicate audiences that match the characteristics of your existing leads. In this way, you can be extremely specific about who’s seeing your content, which should improve your click-through rate and drive up applications. Okay, at this point you’ve taken control and ownership of a robust social media presence that includes both employer branded content and paid ads. But there are still some things that you can’t control. Especially if you’re a larger, higher-profile business, it’s likely that there will be conversations happening about you on social media outside of the pages that you have direct ownership over. This is normal and to be expected, even if it will inevitably lead to some less-than-flattering moments. Treat these conversations as an opportunity to engage authentically with potential applicants. If users see your company as being approachable and easy to engage with, that will be reflected in the willingness of passive job candidates to take a chance on your application process. Consider this a more improvisational branch of your employer brand strategy—it’s still important to highlight your EVP in these conversations, but there’s a lot more room for openness and flexibility. We’ve saved the most sweeping suggestion for last. Hopefully it’s come through in the paragraphs above that social media requires an approach based on communication and engagement with your target audience. What might seem obvious based on the way we’ve described this (but what we’re going to make pretty darn explicit just to be safe), is that the best way to do this is to provide real value to your audience. What does this mean in a recruitment context? First of all, it means providing real, honest information about your business and what it’s like as an employment destination; this will help candidates to better visualize what a career with you would actually look like, helping to assuage the type of uncertainty that so often stops people from applying for new jobs. Secondly, you can provide value to these same people by giving as much insight into your hiring process as possible. Don’t be coy about what you’re looking for in an interview, or how applicants can best prepare themselves. This will help them in concrete ways as they move through your process, and applicants will show their appreciation with an increased willingness to hear your pitch and consider a job offer. Naturally, you can also provide value in the form of educational content from your website or elsewhere—but the key here is to treat education as an end in itself. Applicants who learn to see your company as a valuable resource will be much more inclined to enter your talent pipeline, which will only bolster the effects of every other strategy on this list.